Yes it is unfortunate that we haven’t all been blessed with naturally thick, shiny long locks. Even after many different professional and home remedies, we find our hair never reaches past a certain point. Those elusive natural looking fuller, longer perfect luscious locks aren’t that far away from your grasp …. 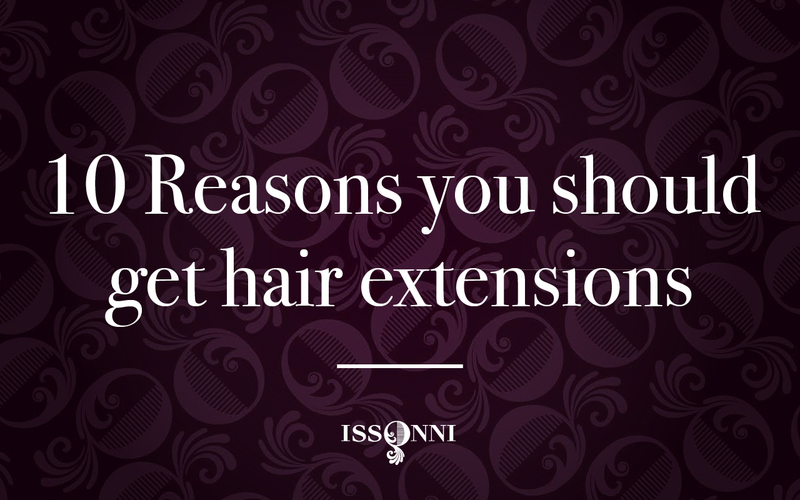 Here’s 10 good reasons why you should get hair extensions. For those of you who have been trying to grow their hair for years. You can become impatient and fed up of the shorter locks. Even after regular trims at the hair salon, our hair can become stuck in time at that ‘one’ length. So whether you are aiming for mermaid waves or creating a long bob from a pixie crop, adding hair extensions can help add inches to hair creating a whole new look. Using extensions is a great way to add thickness to hair. Hair can become brittle and thin at the ends leaving hair wispy and fine through the lengths. By adding extensions, thickness can be created in a natural and subtle way. Yes we all have those days where our hair is a little limp and flat. Even with copious amounts of hairspray and backcombing, by the end of the day our hair is exactly how it was before we styled it. Extensions are perfect for adding a little lift and volume to hair so your not just moving hair around. For many of us, our hair can be sensitive to styling and dyes. Colouring and restyling doesn’t really enhance our own natural hair but makes us wish we had left it alone. As hair extensions are temporary, they can be used to add different styles and tones to hair to create a gorgeous new look. Using different colours can create Highlights, Lowlights, Ombre, Balayage the blending options are endless. Certain hair styles or lengths can mean it is difficult to create different looks. However, with extensions, different hairstyles can be created immediately without having to wait for hair to grow or thicken naturally. It can be difficult to imagine what a certain colour or style can look like on us without trying it out. As a temporary measure, extensions can help create a new look for us that if we aren’t happy with, we can simply remove it. Regular heat styling on hair can encourage dry, brittle ends that can be difficult to style. With hair extensions where excessive heat isn’t being used the hair extensions can bridge your natural hair from heat. Means you are more so styling your hair extensions rather than your hair. Thinking a hairstyle is going to look great and quickly regretting chopping off 5 inches is something all us woman have been through. Extensions help to mend a new bob hairstyle in a flash. For most of us, mornings are not our forte, and an extra five minutes in bed is a lot more appealing than styling hair. With extensions, hair can be styled exactly how you want it, making those mornings a little easier for our hair regime.